Who Is Melvin Bubble? by Nick Bruel: Fun with point of view. Nick Bruel is the creator of the enormously popular Bad Kitty series, which features a feisty and mischievous cat. His writing is funny and clever, his exaggerated characters have vast appeal and his art is brightly colored and engaging. Who Is Melvin Bubble? opens with a letter from a boy named Jimmy, imploring the author to write a book about his best friend Melvin Bubble. What follows is both an excellent lesson in perspective and a well-crafted picture book. 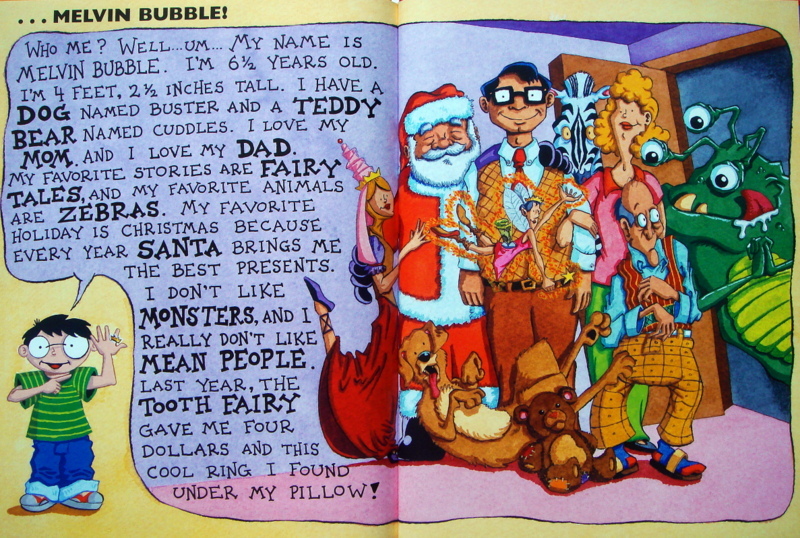 The author asks several people the same question, who is Melvin Bubble? Each response generates a different perspective on this young boy, and gives a bit of insight on the responder as well. The caricature-like characters are vibrantly colored and their responses are encapsulated in giant word bubbles and coupled with visualizations. 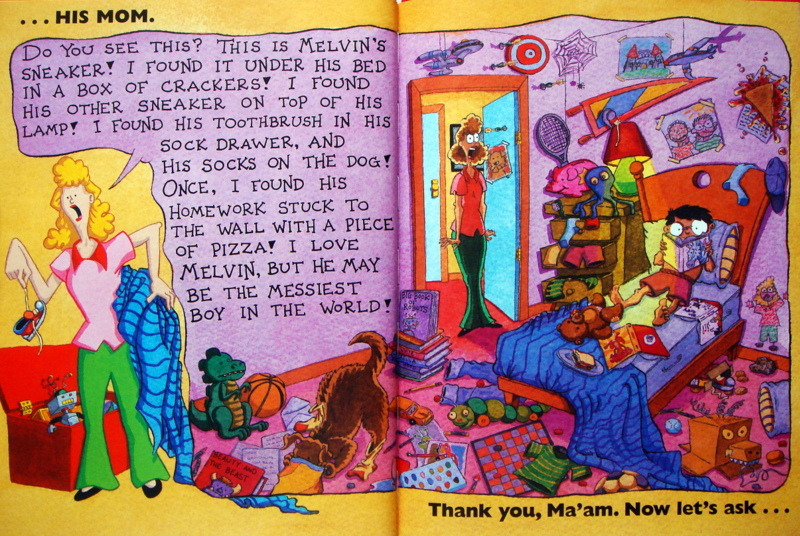 Melvin Bubble’s dad calls Melvin a chip off the old block; his mom says he may be the messiest boy in the world. 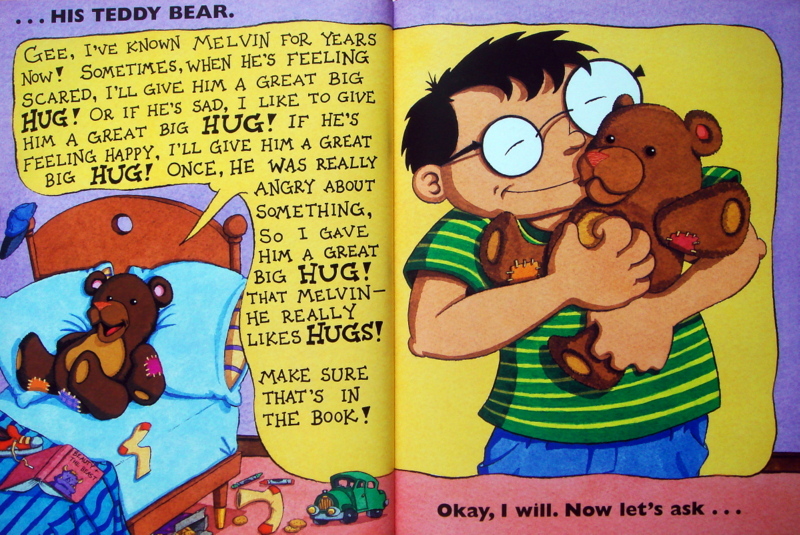 Melvin Bubble’s teddy bear tells readers how much Melvin likes hugs. 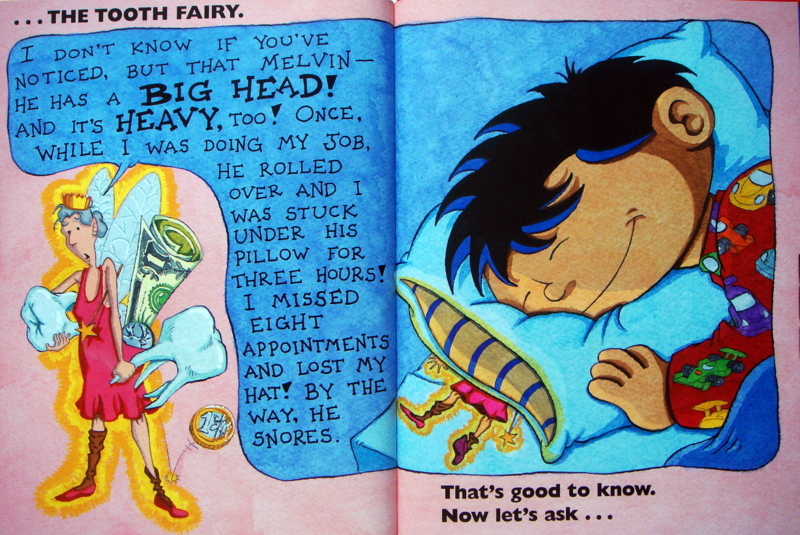 Santa Claus has only good things to say about the boy who always makes his nice list, but the Tooth Fairy had an unfortunate experience having to do with the boy’s very large head. Taking some hilarious turns and building comic momentum, the author also solicits responses from a big, ugly monster with three eyes, a beautiful princess and a magic rock (a wonderful homage to Sylvester and the Magic Pebble by William Steig). The rock turns out not to magic after all so the author turns to a talking zebra instead. 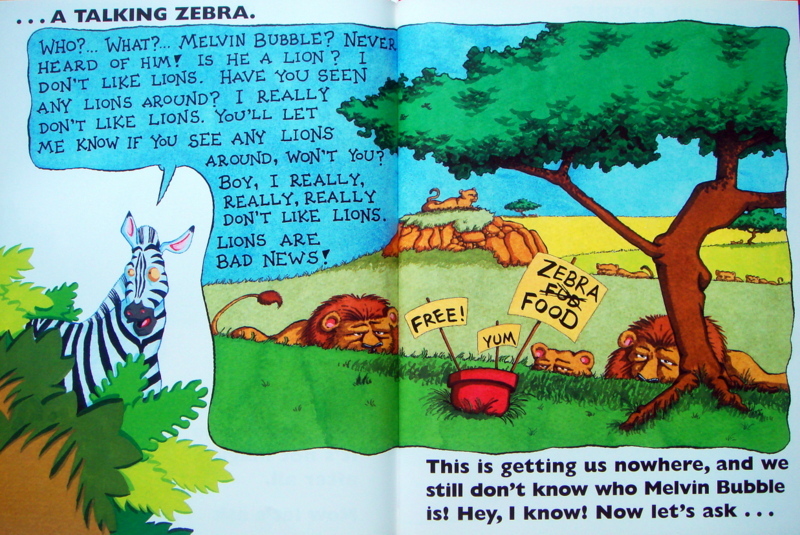 The zebra’s response, a nod to the humor of Looney Tunes, is my favorite. Finally, the author asks Melvin Bubble himself to describe who he is, and all the pieces fall neatly into place. Through its layered perspectives, Who is Melvin Bubble? offers children an opportunity to recognize alternate points of view. It may also prompt them to think more about the concept of identity and how one person can be different things to many people. This hilarious and energetic picture book is sure to be a read-aloud favorite. Bob and Otto: Friends are important. Nick Bruel is a Books of Wonder alum, and the author and illustrator of the wildly popular Bad Kitty books. He’s also written and illustrated many other books and has a clear knack for speaking directly to his audience. I have thoroughly enjoyed all of Nick’s work. His latest book, Bad Kitty School Daze, was just recently released and I have it on good authority that another Bad Kitty book is in the works. Nick’s father, Robert O. Bruel, wrote this story. Discovered shortly after his father’s passing, Nick adapted it for the picture book audience and created the art to accompany his father’s beautiful tale. Bruel’s illustrations have a cartoon-ey feel; he uses rich, saturated colors with bright accents and bold edges. He has interspersed double page spreads with pages of panel art—similar to those in a comic strip—an unusual tactic in a picture book that works perfectly here. Four double page spreads are divided horizontally, depicting the divergent activities of our main characters—the top features preparations for a transformative snooze, while the bottom focuses on a subterranean tour. Bob and Otto are good friends. They both like to play in the grass and eat leaves, but when Bob says he needs to climb a tree Otto doesn’t understand and asks why. So the two friends part ways. Bob climbs and climbs, Otto digs and digs. Bob eats the fresh green leaves off the tree. Otto dines on leaf litter underground. Bob gets sleepy and wraps himself in a cocoon. Otto digs, until he gets quite sleepy, then he digs some more. After many days and nights, Bob awakens as a beautiful, yellow butterfly. He flies all around the tree, testing out his new wings. Soon Bob misses Otto and flies down to the ground to find his old friend. 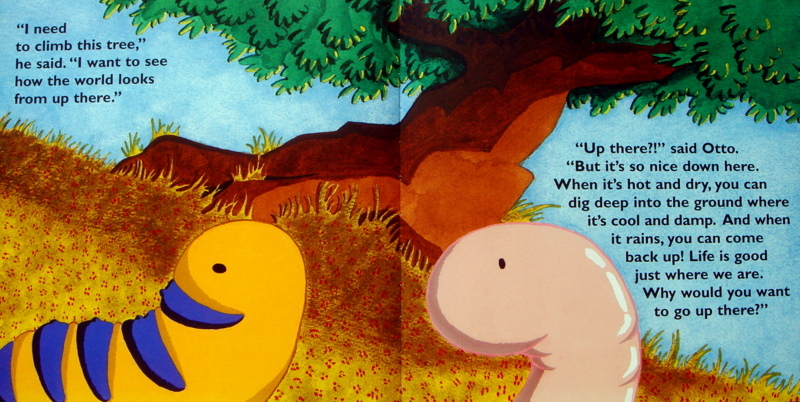 Meanwhile, underneath the tree, Otto misses his friend Bob and starts digging his way to the surface. The friends’ reunion is awkward. Bob has changed. He has wings, and has gained the astonishing gift of flight! 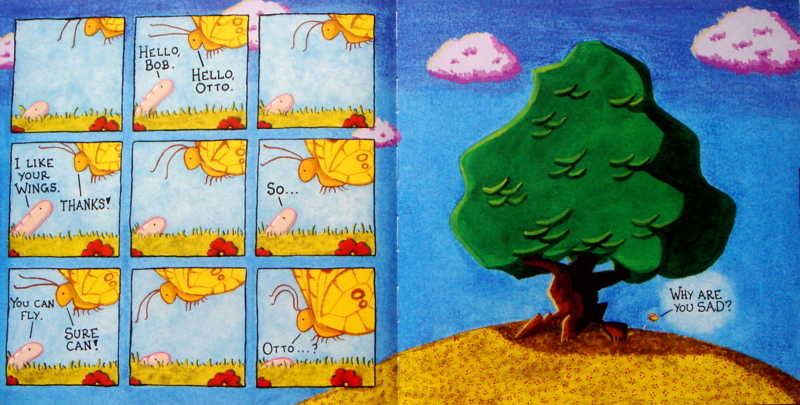 Otto thinks maybe he should have climbed that tree too; maybe he would have also grown wings. 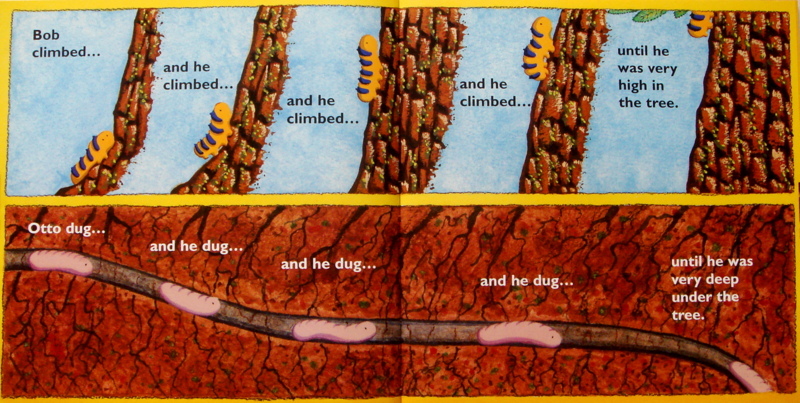 But instead he’s still a worm, whose only mode of locomotion is crawling. 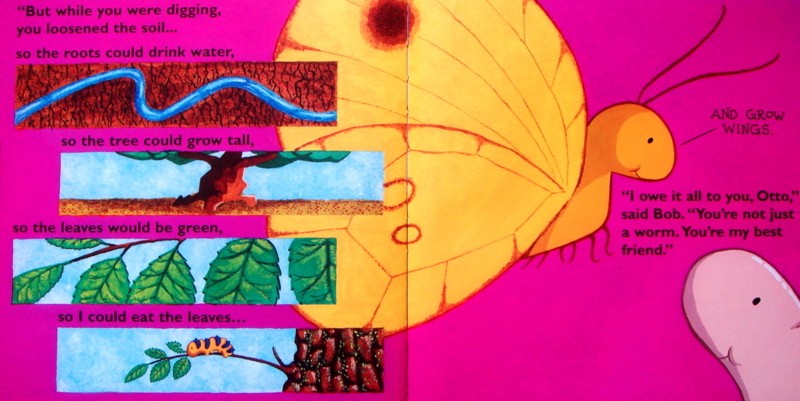 Bob knows how very important Otto is and explains that it was Otto’s digging that loosened the soil, allowing the rain to reach the tree’s roots, which helped the tree to grow tall and strong, and made it a perfect home for Bob to eat, sleep, and grow wings.